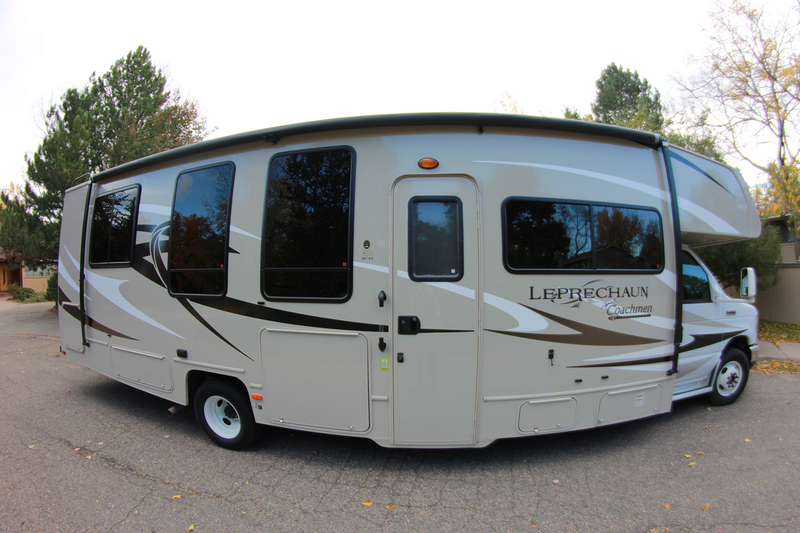 Fisheye view of The Leprechaun in all it’s glory. Prepping in Boulder, CO.
We gambled and drove up the Kolob Terrace Rd outside of Virgin, UT and luckily found a spot close to the Lava Point turnoff. This added an extra 2.3 miles, but we had little choice with signs saying NO RVs. TIGHT CORNERS. Looking back we easily could have parked on the side of the road or at the trailhead. It would have been tight but it would have been fine. 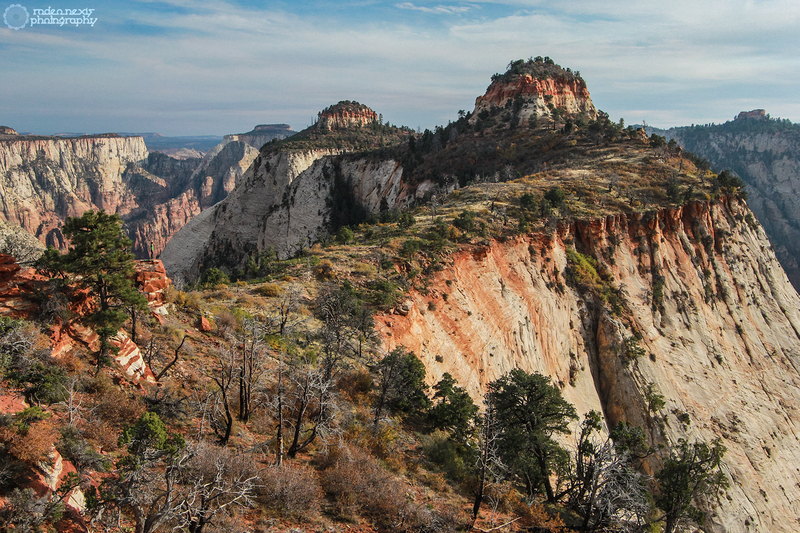 Near the start of Zion’s West Rim Trail. Laval Point TH. 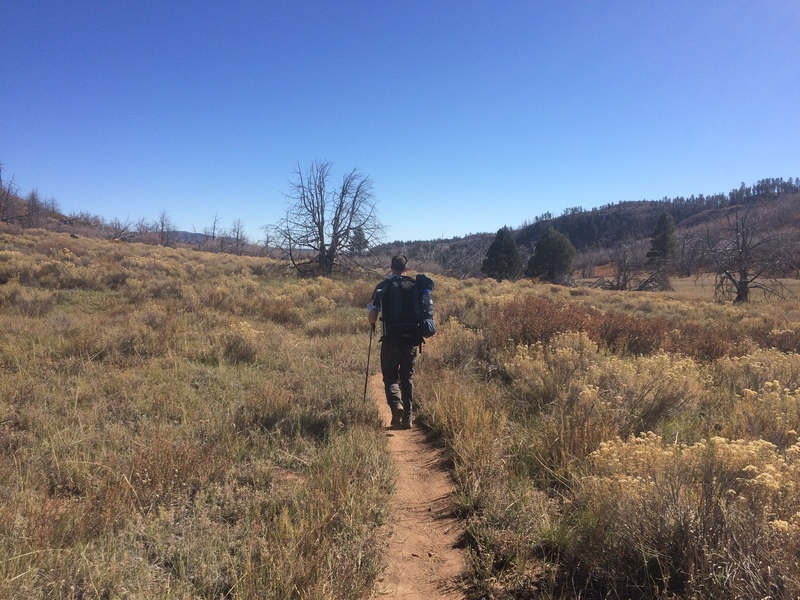 We’d been told the first leg of Horse Pasture Plateau (between the TH and Campsite 8, our first camp spot) was long and uneventful, so we set a breakneck pace to get it done. We expected to meet 2 friends from Denver, CO at camp, so our goal was to get to Potato Bottom with ample time to explore before sunset. Aside from a stop at the Guardian Angels viewpoint for lunch (seen below), the massive canyon country stayed hidden between tall pines. The South Guardian Angel viewpoint, after Sawmill Springs. As seen from the West Rim Trail. Kyler backpacking through the tall grasses leading toward Potato Bottom. Potato Bottom has a seasonal spring right off the trail at the Camp 8 turnoff. Site 8 has easy access to a deep and mildly photogenic arm of the canyon. Site 7 has a different type of view over a burned out section of the valley. Last but not least, hiking further leads to a big uphill that will ruin tired legs. Both sites were decent, but to get any type of grand view we had to slog it up the next steep mile to get to the “Hammerhead View Point.” We caught a few glimpses of sunset after a decent rest, and made it back to camp to call it an early night. There was no sign of our friends, but we were too beat to think about it. Did we hike 10 miles? Maybe 11? I was too tired to add it up, but my camp pillow felt just fine as I drifted off to sleep. The Hammerhead Viewpoint in dying sunlight. Looking SW toward Grafton and Virgin UT. 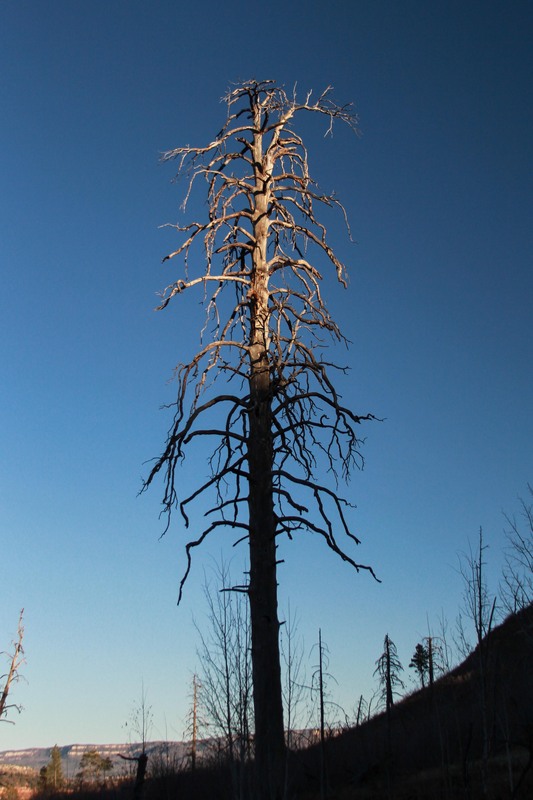 Potato Bottom was full of massive burned out trees like this one. Campsite 7. 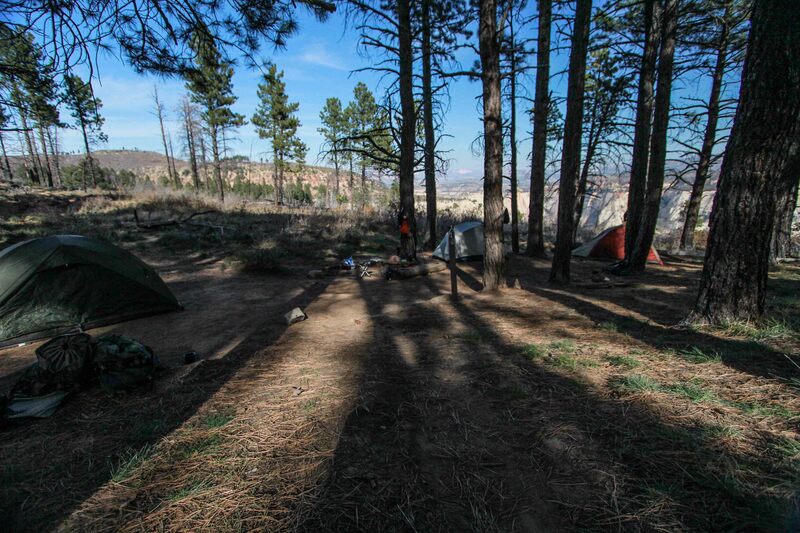 Going to bed at 8:30pm was no big deal since fires aren’t allowed in the Zion backcountry. Not to mention the temperature dropping to 20 degrees once the sun went down. So when 4:30am buzzed my iPhone to life, I wasn’t hurting as much as I thought I would, but I was surprised not to see another tent set up in the middle of the night. Our friends still hadn’t shown. It was surprising, but there was nothing we could do about it. We made quick work of Cliff bars while we packed up, and pushed onward and upward toward the real prize of our backcountry outing. Once reaching Camp 5 we dropped our bags and showed the camera our excitement. Kyler rests his weary legs at the viewpoint across from Camp 5. Site 6 lies to the right of the trail, looking NNW toward the Left Fork of North Creek (where The Subway hides) and Ivans Temple. We didn’t explore this spot but it seemed wooded and relatively protected from high winds. Site 5 is by far my favorite. 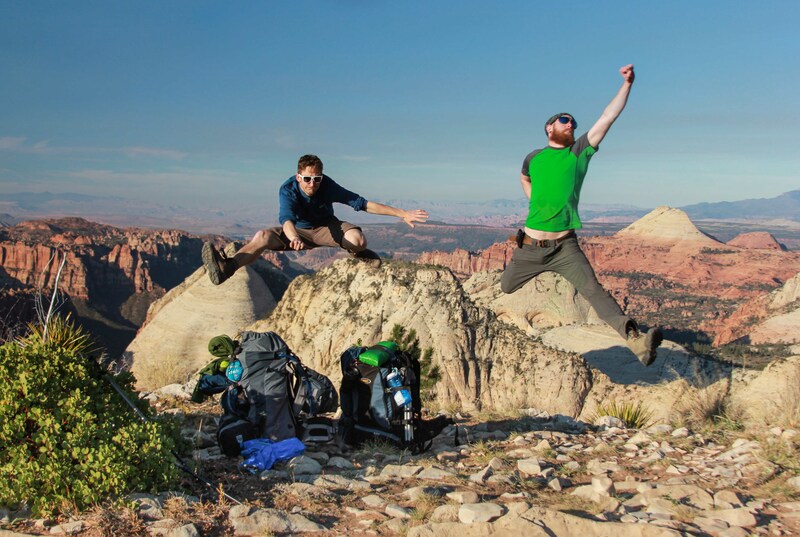 It has sweeping views of the Right Fork of North Creek, South Guardian Angel, Ivans Temple, and other prominent sheer-cliffed, flat-topped mesas. The actual site sits to the left of the trail and back from the rim. Site 4 is quite similar to 5, but a little further back from the rim to the left of the trail. It’s closest views look SW over the canyon country. Site 3 lies on the trail’s gentle descent down off the highest points of the plateau. 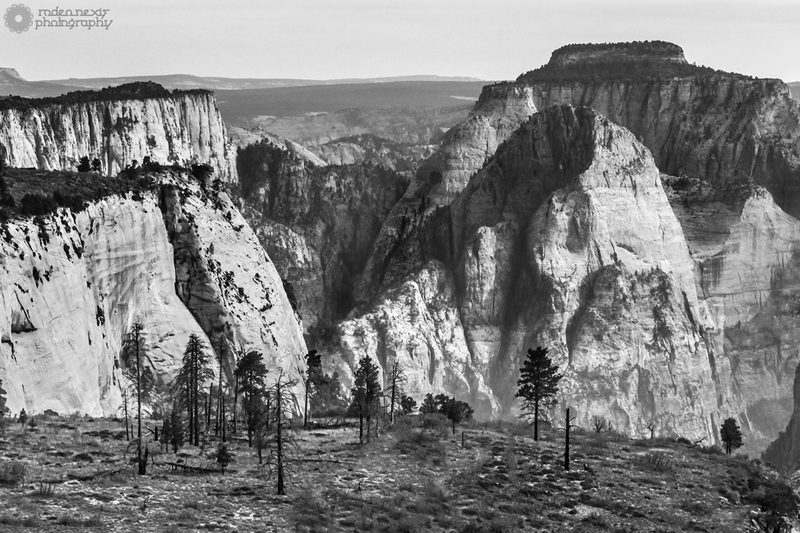 Also on the inward side of the trail, it looks South toward Heaps Canyon and Court of the Patriarchs. After this site the trail ducks back into the woods and slopes downward. Approximate location of Campsites 1 – 8 on the West Rim Trail. Thank you NPS for this fine map! NOTE: Sites 4 and 5 are on the highest point of the plateau, and are exposed if there’s a storm or high winds. 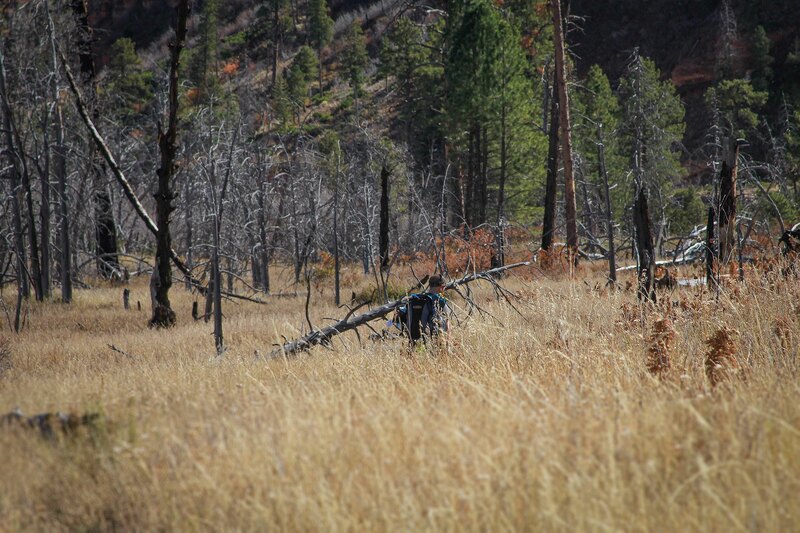 There are trees, but many are burned out from past fires and there’s little protection. 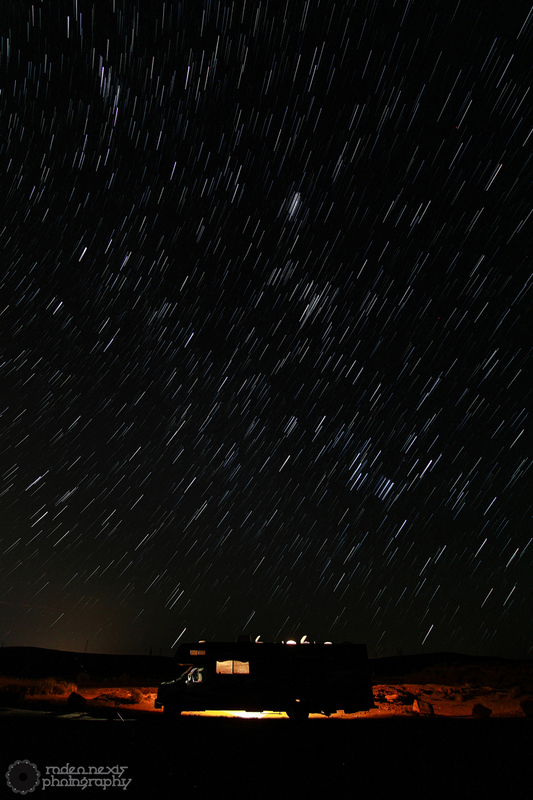 It was cold in Potato Bottom and the winds kicked up as night fell. We commented on how cold it would have been if we’d stayed higher up. The views would have been worth it, but the November night would have been very uncomfortable. 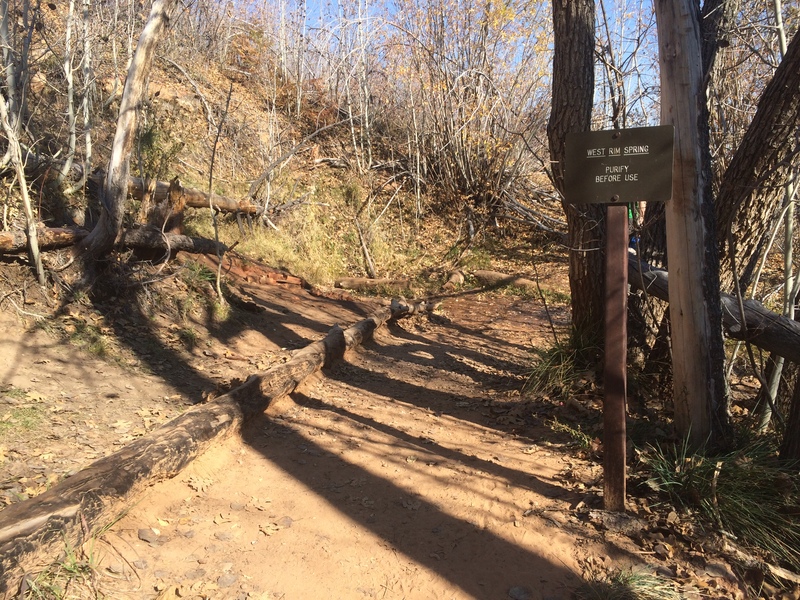 The trail skirts a steep drop off. Temple Mountain is seen to the right in the distance. Between sites 3 and 2. By the time we reached the steep downward approach to Campsite 2, we found ourselves back on the edge of the rim looking out over the canyon again. We could begin to see into Zion Canyon (the main attraction of the park). We were so excited we started yelling and hearing the echoes off the canyon walls. Immediately we heard an answer from far below. It was our friends from Boulder! Without delay we booked it down to Campsite 2 where they had poached a spot the night before, due to heavy backpacks and a steep uphill climb from The Grotto. We moved their camp over to our reserved campsite 1 and enjoyed the sun. Sites 1-2 are great because they are at the end of a long uphill climb out of the main canyon, they have magnificent views moments away and Cabin Spring is a year round water source right next door. We gorged ourselves on icy cold water since it was so easy to refill. Cabin Spring is perched high on the rim above the West Rim Trail. There’s a big drop just to the right. 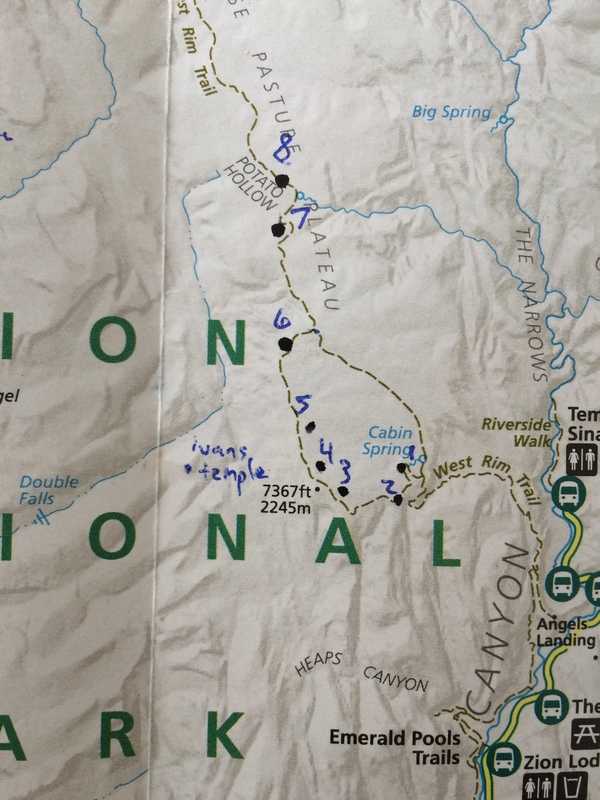 A map of our bushwhack off the West Rim Trail, and locale of the SECRET CAMP SPOT on the ridge. I wish we had camped there instead of Campsite 1!!! Thank you Gaia GPS. We discovered a secret camp spot at a rise on the ridge, complete with a fire pit, tree for shade, and rocks for seats. It was so spectacular we debated running back to our tents to move camp…but with the sun falling fast it was a futile idea. The route to the site is in orange, and the red waypoint is the campsite. 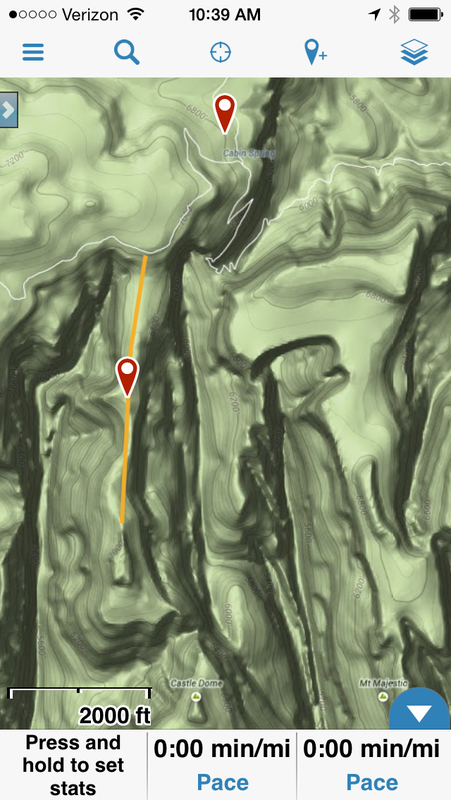 The picture above showed the rest of the route we took to climb the sandstone dome from the secret camp spot. 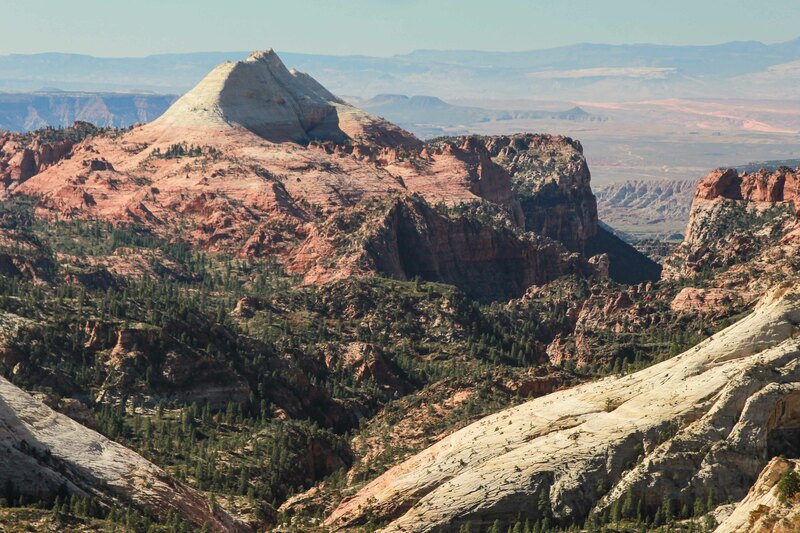 A view from the sandstone dome NW toward campsite 3 and the West Rim Trail high atop the distant plateau. We had never felt so content after a big hike, an unknown bushwhack, and a beautiful backcountry view. The view was astounding, but the sunset never culminated. As twilight turned to dusk, we turned on our headlamps and made the trek back to the main trail over pock-marked boulders and scraggly bushes. The next morning Derek and Katherine stayed in bed while Kyler and I packed up before sun up. We had made our way down almost half of the steepest section before light began to warm the sky. We made our way over barren slickrock canyon floors, and found our way to Scout’s Landing before seeing another hiker. As soon as we rounded the bend for Walter’s Wiggles though (the million and one switchbacks that lead hikers up to Scouts Landing and Angel’s Landing), we were met with an onslaught of day trippers and flatlanders. Many of them looked at us in disgust with our unkempt attire and awful B.O., but we couldn’t have been happier. It was another successful adventure in the backcountry! Leave the RV at home. It will inhibit your ability to see the best parts of the park. Hell, you can’t even park it in most places. 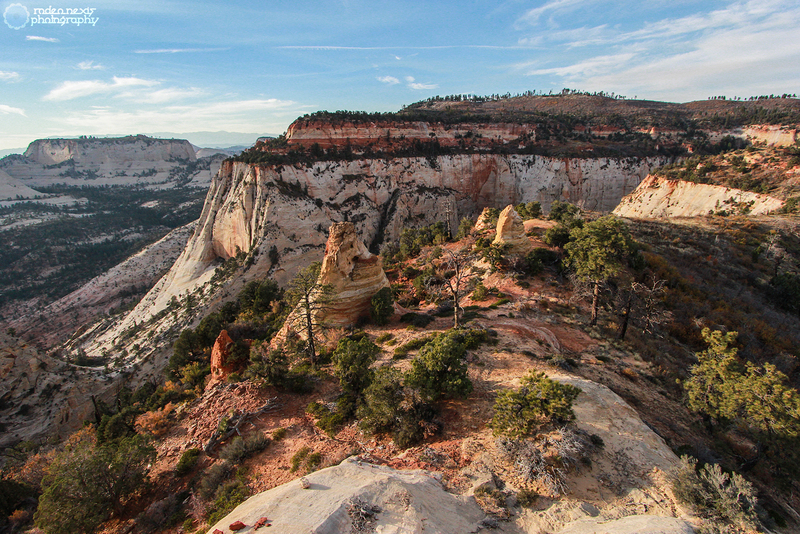 Bring a trusty car or truck, and hike to gain access to Zion’s hidden gems. Starting at Lava Point gave us a lesser seen view of Zion and its backcountry, but it took a lot of energy and yielded few great views. If done again, I’d start at The Grotto and deal with the nasty uphill climb with a heavy pack just to witness more of the main canyon. I’d spend night 1 at Campsite 1 or 2, and move farther up the rim for night 2 (ideally campsite 4 or 5). If time had allowed, I would have hiked Telephone Canyon on the other side of Horse Pasture Plateau. It looks down into The Narrows of the Virgin River and would have been a nice change. I wouldn’t have brought so much water to weigh down my bag. CALL THE VISITOR CENTER and get updated info on water sources. If Cabin Spring is running, save the weight and fill up once the hardest part of the backpack is done. Lastly, if I’d known about the secret camp spot I would have camped there for BOTH nights and saved myself the $30 in fees. Not to mention I would have had the best views right out of the door of my tent. Thank you for spending time to read this report. it was written in hopes that others will be more educated and maximize their experiences in the great outdoors. 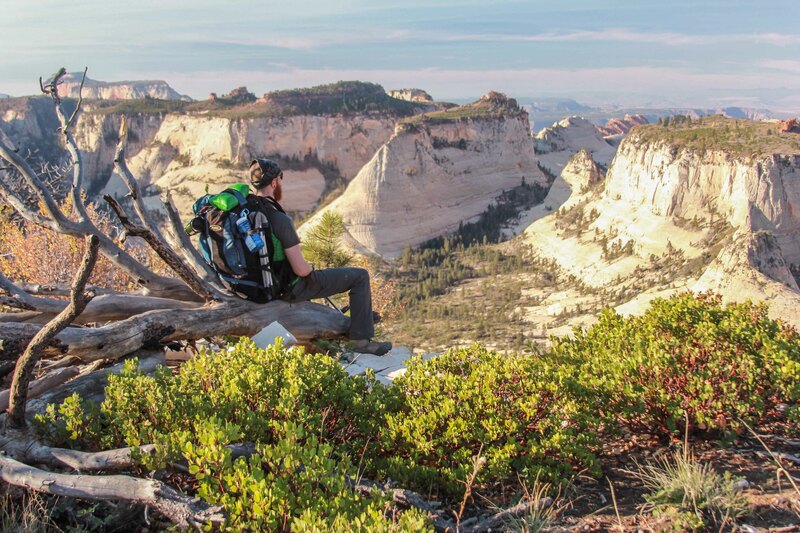 Stray from the beaten path and find a little slice of heaven in the backcountry. Cheers! 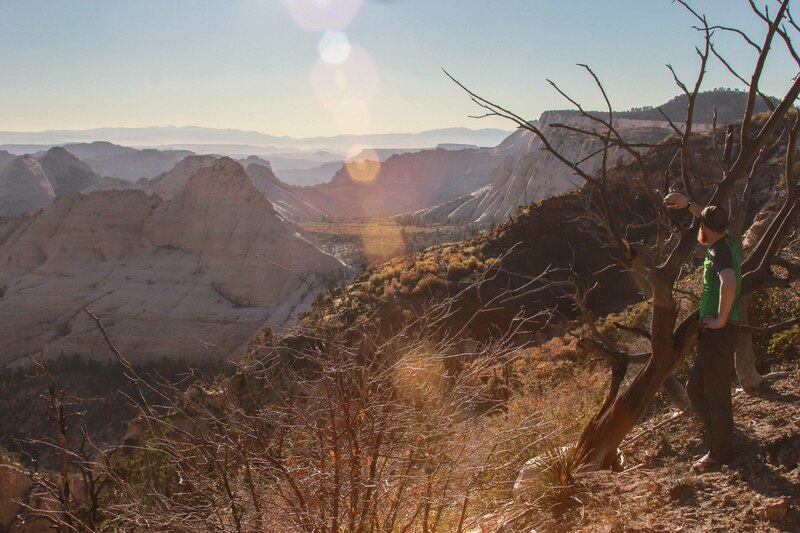 Joe’s Guide to Zion National Park – Great photography and trip reports. 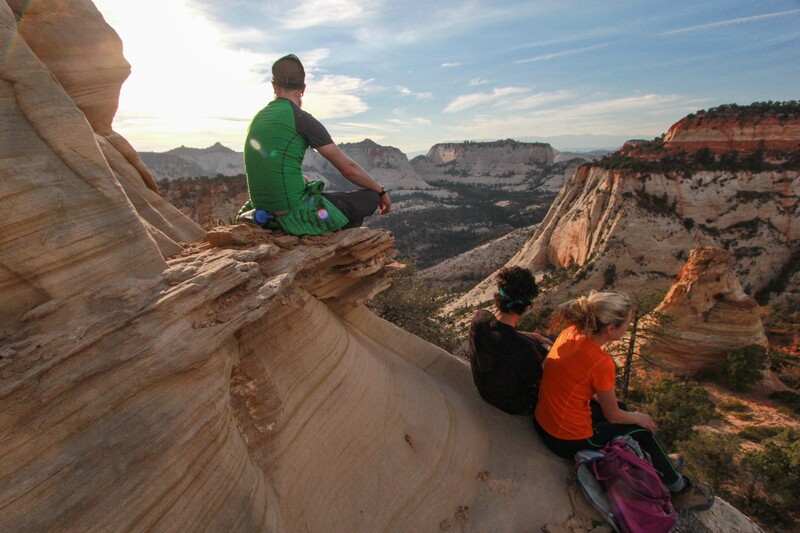 Zion on a Core Strand – The Frugal Traveler’s Guide – Zion secrets. 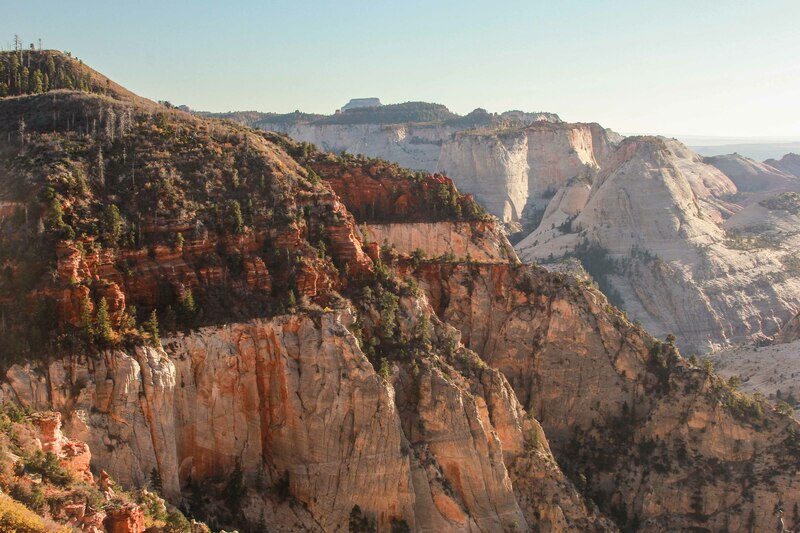 National Park Service – Zion – The official site for travel and exploration in Zion NP. Reblogged this on Rodeonexis Photo.